Casement windows are a popular choice in Canada due to their energy efficiency and easy maintenance. They are similar to awning windows as they open with a crank mechanism, but they are hinged on the side, like a door, instead of at the top. Unlike any other window, casement windows are equipped with a weather compression-fit on all four sides to ensures a tight seal, and therefore higher energy efficiency. In other words, if you want to save money on your electricity bills, a casement window is the right fit for you. They are made from 100% lead-free uPVC which keeps their colour from fading and is resistant to all weather conditions. They are easy to operate due to a crank operating lever. Basically, no effort is needed to open or close the window. Casement windows have no bars or rails in the middle, offering you an unobstructed view of the outside world. They are available in a variety of colours and materials. All of our products here at by Milano Windows and Doors Inc. meet Canadian and USA window standards and are CCMC approved. Our team consists of licensed and insured workers who are able to perform quick and quality work on projects of any size. Our products are sold under a transferable lifetime warranty that includes any defects in the windows and doors installed as well as flaking, blistering, peeling, corrosion or fading of the vinyl frames. 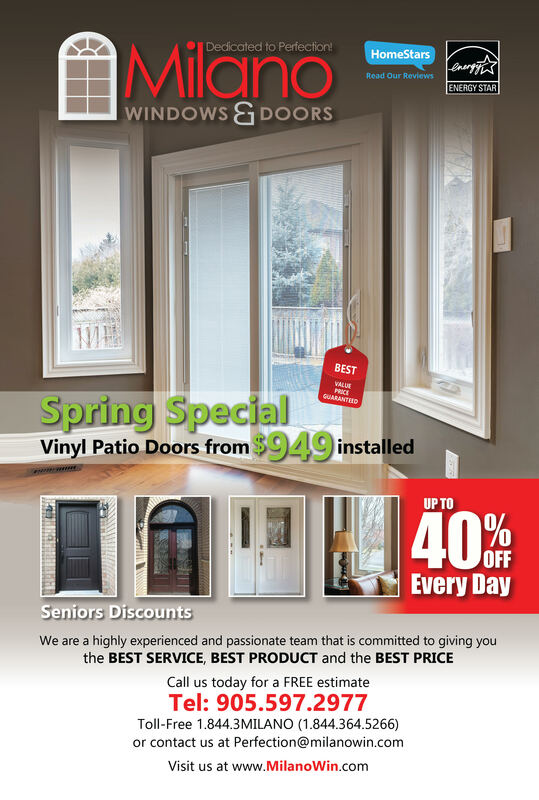 For the best window and door installation service in the GTA, give us a call today.